The Zen Report Tutorial section of the chapter Introducing Zen Reports explains that a Zen report is a class that extends %ZEN.Report.reportPage. The Zen Report Tutorial explores the structure of a Zen report class by building it in gradual steps. The word parameter is widely used. This section describes several kinds of parameter that you can use to change the way a Zen report class operates. In each case, the item is called a parameter when it is used to control the Zen report, but in each case, the context and syntax for using the parameter are different. Class Parameters for General Use provide the general processing instructions for a Zen report. Each ? placeholder in the query requires its own <parameter> element. A data type parameter is an ObjectScript convention that you can use in Zen report classes. For an overview, see Parameters in the Data Types chapter of Using Caché Objects. It is possible for a user to pass XSLT stylesheet parameter values to Zen reports via URI query parameters when invoking the Zen report class. 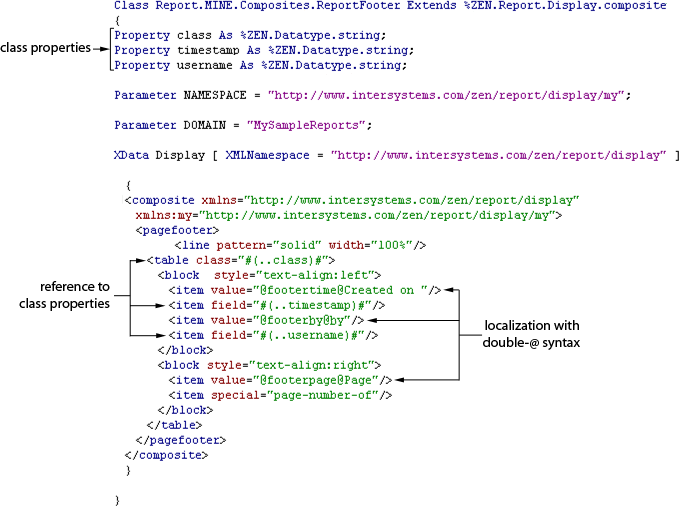 Parameters defined in this way become XSLT global variables inside the XData ReportDisplay <report> element. This convention requires careful coordination of an <xslt> element within the XData ReportDisplay block with a Zen report class property that has at least one property with the ZENURL data type parameter defined. In addition to the URI query parameters that you might introduce with ZENURL, Zen reports offer several predefined URI query parameters that you can use at runtime to override the values set by the corresponding Zen report class parameters. By convention, the names of these parameters begin with dollar sign ($). Properties of the Zen report class. The section Organizing Zen Reports to Reuse Code describes how to use composites and templates to define reusable portions of code that you can reference from XData ReportDisplay in the main Zen report class. Runtime expressions work in composite and template classes. This is because, at runtime, Zen integrates the XData material from composites and templates into the code generated by the XData ReportDisplay that references them. Any runtime expressions found in the composite or template classes become part of the higher level XData ReportDisplay block. Runtime expression #()# syntax does not work in XData ReportDefinition blocks. The Zen Localization chapter of the book Developing Zen Applications explains how to substitute translated text for different language locales in Zen applications. These concepts apply to Zen reports as well. Anywhere that you use the Zen data type %ZEN.Datatype.caption or $$$Text macros in the code for a Zen report, the corresponding text value becomes an entry in the message dictionary for that namespace, from which it can be exported for translation. Later, the translated text can be imported back into the message dictionary to localize the application. Localization works only if the DOMAIN parameter is defined as a non-empty string in the Zen report class. Messages for classes in the same localization DOMAIN are stored together in the message dictionary for that namespace. Many attributes of Zen report components are already of type %ZEN.Datatype.caption and so automatically support localization. Their descriptions in this book indicate when this is the case. You can use $$$Text macros anywhere that ObjectScript is supported, including the values of Zen report runtime expressions. Additionally, Zen report classes offer a shortcut to invoking the $$$Text macros. This shortcut is available only within an XData ReportDisplay block in a Zen report class. Unlike when you use the $$$Text macros, when you use the double-@ shortcut it is your responsibility to ensure that each message identifier ("footertime" in this example) is unique across the localization DOMAIN. The section Configuring Zen Reports for Excel Spreadsheet Output describes how to use Zen reports to create Excel spreadsheets. When you create spreadsheets, the excelName attribute of <element> provides text for column headers in the spreadsheet. When you use a ReportDefinition block that has the required specific structure, excelName supports localization by automatically putting the column header text into the message dictionary. When you use the ReportDisplay block to create an Excel spread sheet from XML in an arbitrary format, you must take some additional steps to localize the column header text. Such reports require the output mode displayxlsx, so you must set DEFAULTMODE or $MODE appropriately. You must also set the DOMAIN parameter. DOMAIN is an arbitrary text string, used to match entries in the message dictionary with the classes that generated them. Localization does not work if you have not set DOMAIN. Create a ReportDefinition block that provides XML for the report, such as the one in the following code sample. sql="SELECT TOP 10 Name,DOB,Age FROM Sample.Person"
Define a ReportDisplay block that formats the report for Excel output. The $$$ at the start of the value of excelName marks that text value for localization. The name of the report must be the same in the ReportDefinition and the ReportDisplay. Translate the exported message file, and save the localized versions. In designing a suite of Zen reports, you might discover that you wish to reuse portions of your page design in other reports. Reuse ensures consistency among related reports and generally speeds development. Zen reports offer two ways to achieve reuse within XData ReportDisplay blocks: composites and templates. The primary distinction is that composites can accept parameters at runtime, and templates are entirely static. The SAMPLES namespace provides a detailed code example in the ZENApp package. The Zen report class ZENApp.CompositeReport.cls defines a report that renders identically to the ZENApp.MyReport.cls example, except that it does so using composites and templates. 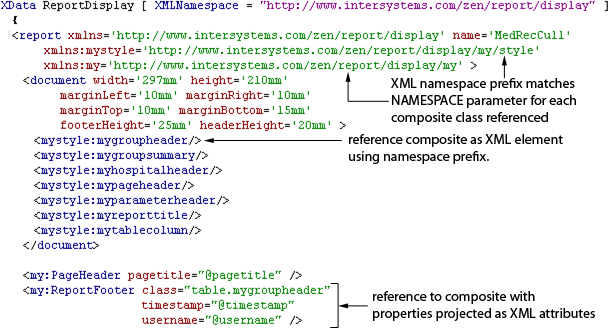 The ZENApp.CompositeReport package contains several classes that define the composites and templates referenced by ZENApp.CompositeReport.cls. This topic uses the term composite to describe a block of Zen report syntax that you wish to define separately and then reference repeatedly to provide consistency and reusability for your Zen reports. Like templates, composites can define any part of the XData ReportDisplay block, including elements you would normally place within the <document> <body> or <report> containers. Unlike templates, composites can accept parameters whose values are supplied at runtime. These parameters must be defined as properties of the composite class; you supply values for these properties when you reference the composites in the XData ReportDisplay block of a Zen report class. As long as the set of properties defined in the composite class does not change in any way, a composite class may be modified and recompiled without recompiling the classes that reference the composite. The composite changes are picked up at runtime. A Zen report composite is a subclass of %ZEN.Report.Display.composite that contains an XData Display block. Unlike templates, the name of the definition block for all composites must be the same: XData Display. Inside the XData Display block is the definition of the composite. This definition is substituted into the code generated by any XData ReportDisplay block that references the composite. In addition to an XData Display block, the composite class can define properties; the purpose of these properties is to allow you to pass values to the composite to modify details of its XData Display definition at runtime. The sections Creating a Composite to Define Style and Creating a Composite to Define Layout show the parts of a %ZEN.Report.Display.composite class in more detail. The following figure highlights key parts of a %ZEN.Report.Display.composite class whose purpose is to define a set of style classes to place within a <document> container. A detailed description follows this figure. A composite class must extend the class %ZEN.Report.Display.composite. The class must define the NAMESPACE parameter. This parameter can have any value you wish. The name of the XData block must be Display. The top-level container element in XData Display must be a <composite>. It can have an xmlns attribute value that is the same as, or different from, the value of the XMLNamespace keyword. Define a supplementary XML namespace name for the <composite> container using xmlns: attribute syntax, as shown. This new namespace becomes important when you reference the composite from another class. It has the same value you used for the NAMESPACE parameter. In the example, this new namespace is called mystyle. The purpose of the composite class shown in the example is to define a set of styles to place within a <document> container in a Zen report. Over time you might accumulate a large library of style composite classes. To ensure clean naming conventions for managing these classes and references to them, InterSystems recommends that you construct style names based on the simple name of the class itself, as seen in the example (the style for table headers, th.mygroupheader, takes its style name from the class, whose simple name is mygroupheader). The following figure highlights key parts of a %ZEN.Report.Display.composite class whose purpose is to define a <pagefooter> within a <report>. A detailed description follows this figure. When a composite class uses a runtime expression like this, it expects its caller, the Zen report, to send it a value for the username property that works correctly as a value for the <item> field attribute. The next section, Referencing a Composite from a Zen Report, shows a correct example of this relationship. If a property value sent to a composite from the Zen report is wrong for that composite, the corresponding section of the report fails. The following figure highlights the XData ReportDisplay block of a Zen report class that references several composites, including those defined in the previous sections, Creating a Composite to Define Style and Creating a Composite to Define Layout. Following this is a detailed description with numbers to match the figure. 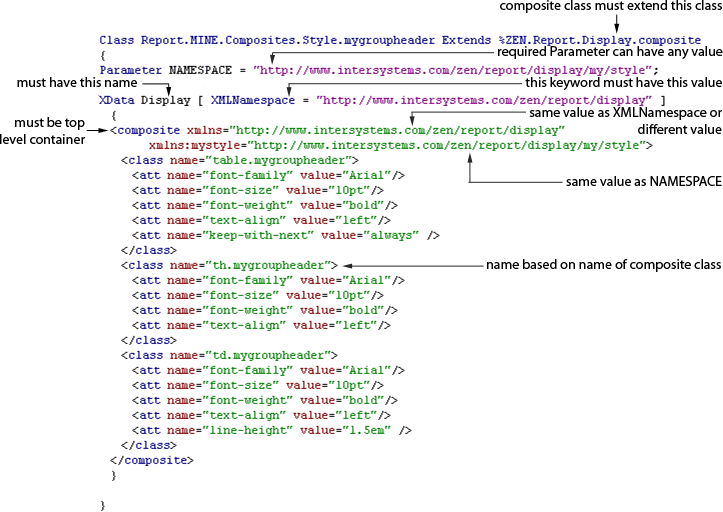 The <report> element must define an XML namespace prefix to match the NAMESPACE parameter value for each composite class that it references. Do this using xmlns: attribute syntax. The example gives style composites the namespace prefix mystyle and layout composites the namespace prefix my. This separation is arbitrary, but makes sense as a way of organizing composite classes. This reference causes all the code between <composite> and </composite> in the mygroupheader composite class to be substituted at this location in the XData ReportDisplay block. Here we have the namespace name my and the composite name ReportFooter. To review the syntax in the ReportFooter composite class, see the section Creating a Composite to Define Layout. This composite has three properties, class, timestamp, and username. This reference causes all the code between <composite> and </composite> in the ReportFooter composite class to be substituted at this location in the XData ReportDisplay block. During the ReportFooter substitution, anywhere the class, timestamp, and username properties are referenced in the composite class, Zen substitutes the values that you assigned in XData ReportDisplay. In this example, the class value is a literal string. Values for timestampand username come from attributes in the XML generated by the XData ReportDefinition block in the same Zen report class, so they use XPath @ syntax. Alternatively, you could use a Zen report runtime expression as the value of any attribute of a composite. This topic uses the term template to describe a block of Zen report syntax that you wish to define separately and then reference repeatedly to provide consistency and reusability for your Zen reports. Like composites, templates can define any part of the XData ReportDisplay block, including parts of the <document> block and parts of the <body> block. Unlike composites, templates are entirely static; they cannot accept parameters. A template provides simple code substitution. You can define a display element, such as a <header> or <footer>, as a template. Then you can reference that template when you place the display element inside the <body> block of your XData ReportDisplay definition. The template definition of the element entirely replaces any attributes or other children of the element. Templates are only instantiated at runtime. You may use runtime expressions and data items in defining a template; however, any runtime expressions or data items used in a template are evaluated in the context of the report or composite that invokes the template, not the template class itself. The previous template example works only if the data items that it refers to (@month, @author, @runBy, and @runTime) actually exist in the XML data generated by corresponding XData ReportDefinition block. Each element that contributes visible content to the report display  that is, each element that may appear within a <body> block  supports the template attribute. To see a list of display elements, refer to the <report> and <body> sections in the chapter Formatting Zen Report Pages. The following table describes the template attribute that all of these elements support. Zen would ignore the value of this width attribute, and instead use whatever width characteristics it found in the Header1 template definition. If it found no width value in the template, it would use the Zen defaults for width, rather than the width attribute provided with this <header> element. If you are already familiar with XSLT, you might have used <xsl:call-template> syntax to invoke a specific template within an XSLT transformation. <xsl:call-template> permits you to supply parameters and values to the template when you invoke it. Display elements support a similar convention. In addition to the XData blocks called ReportDefinition and ReportDisplay, Zen report classes support three XData blocks that can contain XSLT templates. The following table lists them. If you need to use more than one <xsl:template>, you can enclose them in an <zenxslt> element. See the section XData Blocks for <xslt> for more information on <zenxslt>. XData blocks that contain XSLT templates can be in the same report class where they are used, or in a separate report class, where they can be used by a number of reports. The name provided for the <xsl:template> container in XData HtmlXslt and XData XslFoXslt can be the same name, because these two XData blocks are never used together. If there is an XSLT template that you need for both output formats, place it in XData AllXslt. The stylecall attribute identifies the <xsl:template> name. The styleparamNames attribute identifies the <xsl:param> name as defined in the <xsl:template>. Additional names may appear, separated by semicolons. The styleparams attribute provides an expression that identifies the value to assign to that parameter. A styleparams expression can be a literal value, node set, XPath expression, or XSLT function call. Anything that is valid as a value for <xsl:with-param> in XSLT is valid in styleparams. More than one expression may appear, separated by semicolons. The number of styleparamNames and styleparams must match. The result is that entries with even numbered IDs are colored red. See the table of attributes in the section Report Display Attributes for more information on these attributes. The feature described in this section applies only to the <item> element. The call attribute identifies the <xsl:template> name. The paramNames attribute identifies the <xsl:param> name as defined in the <xsl:template>. Additional names may appear, separated by semicolons. The params attribute provides an expression that identifies the value to assign to that parameter. A params expression can be a literal value, node set, XPath expression, or XSLT function call. Anything that is valid as a value for <xsl:with-param> in XSLT is valid in params. More than one expression may appear, separated by semicolons. The number of paramNames and params must match. The properties call, paramNames, and params are supported only by the <item> element. See the table of attributes in the section <item> for more information on these attributes. As described in the section Zen Report Tutorial, a Zen report class is also a CSP page. This means that, at runtime, portions of its logic may execute on the server and portions in the browser, as is normal for CSP pages. By default, Zen report classes process XSLT and generate XHTML output on the server, then ship the results to the browser for display. This behavior is controlled by the XSLTMODE parameter, which is set to "server" by default. You can set XSLTMODE to "browser" if you prefer, but note that when the output format is PDF, processing happens on the server side regardless of the XSLTMODE setting. Any callback methods, such as %OnPreHTTP() or %OnAfterReport(), that contain custom code in the Zen report class. Any methods invoked by the InitialExpression for any class properties. The ObjectScript function $ZCONVERT ($ZCVT) with the option "L" converts the characters in the given string to all lowercase. The ObjectScript function $GET ($G) returns the data value of the specified variable, or the default for this variable if no value has been set. %request.Data syntax retrieves the value of the $MODE parameter from the URL string that was supplied to invoke the CSP page. See the section %CSP.Request Object in the book Using Caché Server Pages (CSP). The macro $$$GETPARAMETER("DEFAULTMODE") looks up the value of the DEFAULTMODE parameter from the Zen report. If DEFAULTMODE is not defined there, the macro looks up the value from the Application class. The application class is either specified in the APPLICATION parameter, or is %ZEN.Report.defaultApplication. set initVal="all other modes, for completeness"
Set initVal="called from command line, no potential second round-trip." A Zen report is a class that extends %ZEN.Report.reportPage. This base class offers callback methods that you can override in your own Zen report class. Use these callback methods to add any statements that you want Zen to execute before or after it receives the initial HTTP request, generates the XML data source, writes the XSLT stylesheets, creates the report display, or outputs the report in the requested format. OnAfterCreateDisplay() Near the end of the main processing sequence, after Zen creates the report display object but before it outputs the display object in the requested format.